Leicester Tree Care employs qualified tree surgeons to ensure every job is completed to your satisfaction in an efficient and safe manner. Tree surgery includes all types of tree work from the care of fruit trees to the pollarding and maintenance of ancient oaks. Whilst a knowledgeable amateur gardener may be able to successfully look after the pruning requirements of a small fruit tree, bigger and more mature trees are best left in the hands of expert tree surgeons with proper training. A trained tree surgeon will understand how to assess the needs of a tree and treat it sympathetically, ensuring the best possible outcome and health of each tree. For example, it takes an experienced eye to cut a mature tree without destroying the shape of the crown. Our specialists understand which branches to remove so that the crown receives plenty of light but the overal pruning objective is attained. Sadly many diseases and pests are attacking our native trees so we'd advise regular tree inspections to ensure optimum health is maintained and any problems can be treated early. 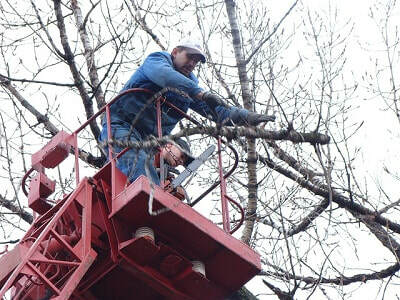 Safety is a huge issue when it comes to removing branches or whole trees. Wood is very heavy and a lot of damage can be done when part of a tree falls in an uncontrolled manner. That's why we advise inspections to ensure all limbs are in a healthy condition and when something does need removing, it's done in a safe and safety conscious manner. Our tree surgeons are fully trained and insured and before they start work they will assess the job and the risks that might arise. They will set about the task in a professional manner, using the appropriate safety equipment for the job, so you can rest assured that you're in good hands.